Having been immersed in nearly the entire Stone Premonitions catalog for many years now, Spirit of Yellow was an interesting listen for me, though in some cases I couldn’t tear myself away from the originals. The new album – Coming of the Unicorn – does in a couple cases draw on the spirit of existing songs, but is largely characterized by the unique Space Rock/Psychedelia/Progressive Rock and song combination that has made the band so special over the years. Joining Census of Hallucinations and Stone Premonitions label founders Tim Jones and Terri~B on this outing are John Simms from Clear Blue Sky on guitar, guitar synthesizer and bass, Maxine Marten on vocals, Stone Premonitions veterans Paddi and Dave Pipkin on drums and Steve Ellis on keyboards, plus guests Michael Steadman (programming), Kingsley burns (bass), and Mike Forse (backing vocals) on a few tracks. The album opens with Something That Affects All People, an intense introductory soundscape instrumental with deep, cavernous ambience, space-prog keys, “Space Ritual” effects, and guitar that is both rocking and spaced out. This segues into Only Time Will Tell, which draws inspiration from Mountain Climbing, a song originally recorded with Tim and Terri’s band, The Rabbit’s Hat, as well as appearing on earlier Census of Hallucinations albums. Here it’s taken into an entirely different direction, being a rhythmic, gently rocking yet cosmically floating song, with guitar that is both rocking and psychedelically mind-bending, plus space electronics and classic, swooning Stone Premonitions vocals. As Within So Without dives back into space, consisting of ultra trippy soundscapes and effects combined with slow, brain massage guitar solos, all supported by an energetic rhythmic pulse. Put The Head On is a majestic heavy rocking space-prog instrumental with killer guitar. This is followed by the playfully mind-bending The Unicorn Is Coming, melting smoothly into Stars, which takes the Census of Hallucinations space classic My God, It’s Full Of Stars and sends it hurtling into a new rocking dimension, without losing the hypnotic exploratory elements. Miracle is a spirited, uplifting, space jazzy soulful vocal number. Electroid is a short, high powered instrumental that leads into the hip shakin’, cool groovin’, space Blues rockin’ Crystal Spheres Of Light. UFO Over Penrith is a spacey trippy interlude that sets the stage for Love You True, with its dreamily passionate and soulful vocals. The album concludes in deep space, with the brief Existential Vertigo and, finally, As Within So Without (Slight Return), a cosmic freakout that closes the set. 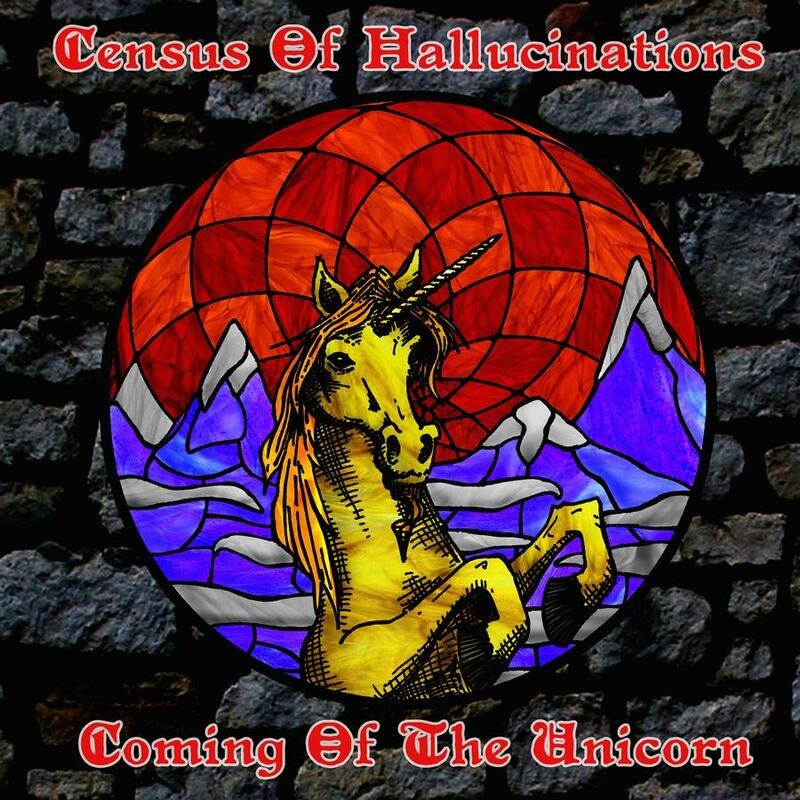 In summary, Coming Of The Unicorn represents Census of Hallucinations at their spaced out best. The album is largely instrumental, but the vocal numbers are well placed, making for a 13 track set that flows seamlessly from beginning to end. I’ll also add that while Tim Jones is a gifted guitarist, adding the incredibly talented John Simms on guitar enriches the music by bringing together two distinct yet complimentary musical personalities. And as with all Stone Premonitions releases, everything is masterfully crafted in the studio. Coming Of The Unicorn has also given me a better appreciation for the more song-oriented Spirit of Yellow. Taken together, the two albums, though very different from one another, represent everything that drew me to the Stone Premonitions world in the first place.